A new partnership was formed as Morning Pointe of Tuscaloosa (AL) received a visit from the University of Alabama Department of Theatre and Dance. 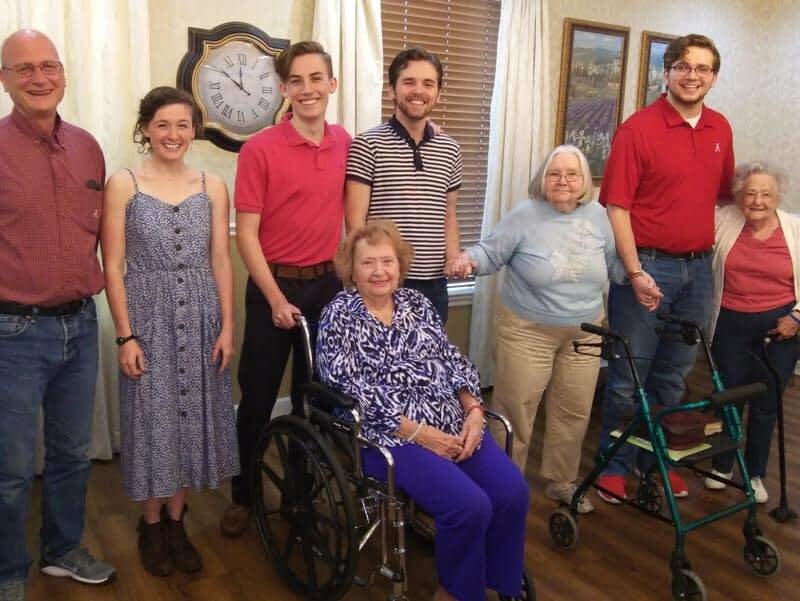 Under the direction of associate professor Stacy Alley, four UA students performed for the residents of the assisted living and Alzheimer’s memory care community, singing songs from musicals like Singin’ in the Rain and Willy Wonka and the Chocolate Factory, old-fashioned hymns, and much more. Morning Pointe of Tuscaloosa prides itself on its strong network of community partnerships. If you are interested in partnering with Morning Pointe, contact community relations director Sarah Pederson at (205) 345-1112 or by email at tuscaloosa-crd@morningpointe.com. Photo Caption: Performers from the University of Alabama Department of Theatre and Dance, including accompanist Terry Moore and students Emily Haynes, Matthew Kelley, Daniel Fobes, and Daniel Baskins, share a group hug with Morning Pointe of Tuscaloosa residents Helen Sprunger, Dimples Metty, and Alice Cox after the students’ performance.